Readdle’s popular Spark email app for iOS just received the biggest update of its young existence. The timing of such an update couldn’t have been better with the unfortunate demise of Mailbox — a once beloved email app that’s scheduled to shut down tomorrow, February 26th. This week we’ll get into the finale of our iPad Pro saga, talk about Dropbox’s decision to kill Mailbox, and why Apple has open-sourced Swift. The Happy Hour podcast is available for download on iTunes and through our dedicated RSS feed. Thanks to Audible.com, get your free 30 day trial at audible.com/happyhour. In a new blog post today, Dropbox has announced the shuttering of the Mailbox app it acquired in 2013, along with the Carousel photos app that launched last year. The beta build of Mailbox for Mac has not seen an update in quite some time, while the iOS version had been left to stagnate, leading many to believe this was the case already, but today’s announcement finally confirms it. Dropbox updated its Mailbox app today with some necessary features and fixes. The update now includes the ability to customize your swipes. Also, new iPhone 6 and 6 Plus owners will appreciate the optimized UI for bigger displays. Finally, Dropbox has squashed some bugs in Push and otherwise improved the overall performance. Dropbox’s Mailbox is still only currently for Gmail and iCloud accounts, but the company reminds us again that other email platforms are on the way. In addition to the updated iPhone and iPad version, the beta version for the Mac is now open to anyone following a public beta coin system for testers before. 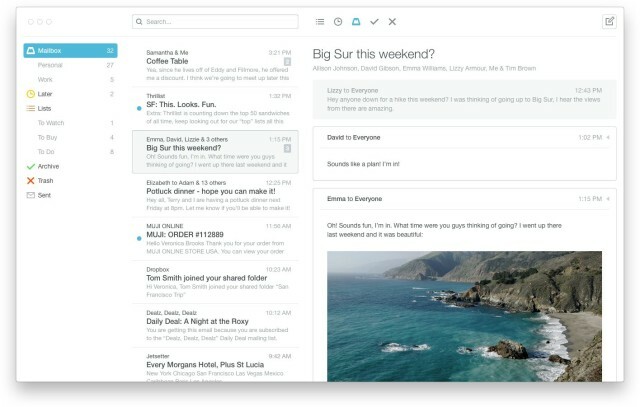 The team behind the famed Mailbox mobile application demoed a very early preview of the app for Mac back in April of this year, not long after announcing that the platform had been acquired by Dropbox. But the team has seemingly been making steady progress, hoping to create the perfect desktop counterpart to its mobile email client. Today, Mailbox announced that the app has reached public beta and that it will be rolling out soon to those who have signed up for the wait list. The popular Dropbox-owned email client Mailbox received a notable update today bringing a list of new supported languages as well as additional features. In addition to English, Mailbox is now translated into the following languages: Chinese (both Simplified and Traditional), Danish, Dutch, French, German, Indonesian, Italian, Japanese, Korean, Malay, Polish, Portuguese (Brazilian), Russian, Spanish (both European and Latin American), Swedish, and Thai. The update also adds support for Apple’s Passbook platform. Previously, emails containing Passbook files would prompt an “Open in…” dialog with Mail and Dropbox supported, but the new version of Mailbox allows users to open Passbook files right in the Passbook app from the email as you would expect. The update also includes a list of other changes including support for printing emails, viewing spam folder emails, spam filtering, adding stars to emails, using military time, and more. Mailbox for iPhone and iPad is available for free on the App Store.